Doc's Golf Tips Online. Claim Your FREE Golf Tips Online Video-Course... Now! and discover if YOU are smarter than most other golfers! About Hitting A Golf Ball. leaving you humiliated and frustrated after every round. Well that's about to end! This breakthrough quiz will quickly bring you "up to speed"
longer, straighter, more powerful golf shots. Hi. It's Doc O'Leary, head golf nut over here at OHP Golf. For over 23 years I've been tapping into the brains of professional golfers to discover exactly what they know that the rest of us mere mortals don't know. You'd be surprised. Over the decades I've discovered a handful of screwy ideas that most amateurs get locked into their heads – and it's hurting their game. You're probably one of them. This quiz is a fast, fun and revealing way to see if YOU know what the pros know, (and I'll bet you don't). 1: True or False. One of the most effective ways the pros increase their clubhead speed is to simply swing their arms faster. 2: What do professional golfers concentrate on most to ensure consistent and accurate golf shots? a. Weight transfer through the ball. b. A good comfortable grip. c. Proper alignment with the target. d. Smooth tempo and timing. 3: The pros agree: Correctly performing this one simple task will ensure you both a good solid "10 yard" chip shot and an additional 30 yards to your tee-shots. What is it? a. Addressing the ball properly ("hello ball"). b. Knowing how to shift your weight throughout the swing. c. Making sure the clubface is in correct impact position. d. Stopping all head movement during the swing. 4: What best indicates if you're lined up to the target properly? d. That invisible line running along the tips of your feet. 5: True power shots are a "chain reaction" that starts where? a. The left hand (for right handed golfers). 6: What is the average core pivot speed of an amateur golfer? a. 85 to 100 mph. b. 50 to 85 mph. c. 15 to 20 mph. d. 1/2 to 1 mph. 8: Which of the following would help you take your good "driving range" swings to the course? a. Practicing on the range just before tee time. b. Playing the same brand of ball you practice with. c. "Seeing" each shot with mental imagery. d. An established pre-shot routine. 9: What do pros say is the quickest way amateurs can improve their game? c. More power and distance. Yes! I Want To Know My "Golf IQ". 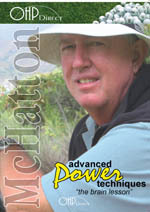 Gregg McHatton is called the "Wizard" by golf Insiders. This instructional package consists of 6 techniques that will allow you to "trick" your brain into allowing your current swing to become the power-heavy monster it was meant to be. 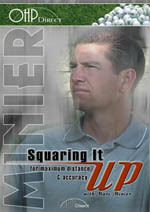 Marc Minier is one of the most sought after professional golf instructors in the US. He's been voted the prestigious Northern Chapter "PGA So Cal Teacher of the Year" four separate times (in '93, '95, '04, and '06).